I just bought a new bed and comforter set. Well after getting it all set up we decided to take a few pics of the finished product. 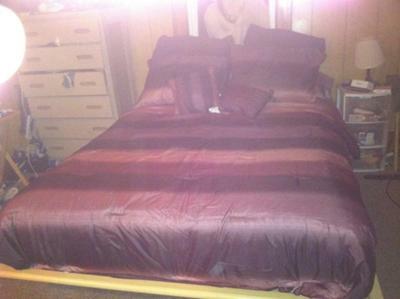 The first pic I am going to submit only looks like an "orb" at the foot of the bed. 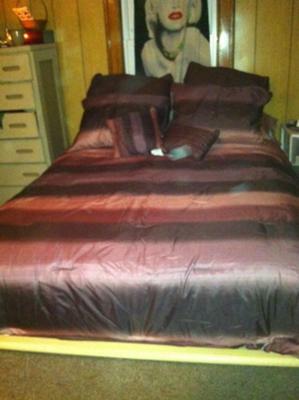 But the second pic there are 3 ON the bed and quite a few more on the left by the dresser. My boyfriend and I both think they are orbs but some friends of mine think they are dust particles. I have always had paranormal things happen to me and have actually heard things and woke up with bruises. But I haven't seen anything with the naked eye until that night (and it was in the pic not with the naked eye). If you could tell me what you think they are I would appreciate it.